The farmhouse was very old, and the spirits of all that had lived in it, dwelled in its rooms as present but invisible forces. As the farmhouse became too old to be lived in and was demolished, those spirits came to light, and, through the energy of the sun, materialized. An ancient spirit had taken the form of a mammoths skull and bones. This mammoth had died where the farmhouse would be built thousands of years later. Its spirit had remained and when the farmhouse was built, it had given this spirit a place to rest. Now, visible in the broad daylight, the skull and the bones of the mammoth lighted up; stark white against the green grass that grew between the razed walls. The hollow sockets of the skull stared into the void and the bones that once carried a giant, lay motionless in the still air. Small tin figures were the materialization of the spirits of the farm animals that had lived in the stables and courtyard of the farmhouse and had grazed in the meadows that surrounded it. Small as the tin figures were, they were standing on a large iron table, for the farm animals had been of great importance to their owners. They had provided them with meat, milk, eggs and wool and this had given the farm animals proud spirits that glistened in the sunshine. They were standing apart from each other, as individuals, just as they had been in their mortal bodies. The spirits of the workers that had toiled and sweated to harvest the grain on the farmland were visible as concrete slabs, piled on top of each other, forming towers of strength. They were high towers, for there had been countless that had worked on the lands surrounding the farm. On top of the towers stood vases that rang with light, tinkling sounds. They contained the spirits of the owners of the farm, the fleeting, light music of their spirits in sharp contrast with the heavy, sturdy spirits of the workers. A shrine containing a statue of the Holy Mother was the form the spirit of the faith, that had lived in the hearts of the pious farmworkers, had taken. The statue was partly phallic, for the Mother united the two eternal poles, male and female, in Her being. A candle on the roof of the shrine burned as a beacon to guide lost souls on their journey through live, towards the loving embrace of their Mother. Her faithful companion, the Dove, was resting under the roof of the shrine. He moves in mysterious ways, but is never far from where She is. All those spirits were visible in the daylight, awakened and made solid by the rays of the sun, but as the night fell and the sun disappeared, the spirits vanished too. The next morning, the wet grass glistening with the morning dew, there was nothing to be seen but the bricks that outlined where the farmhouse- had stood. 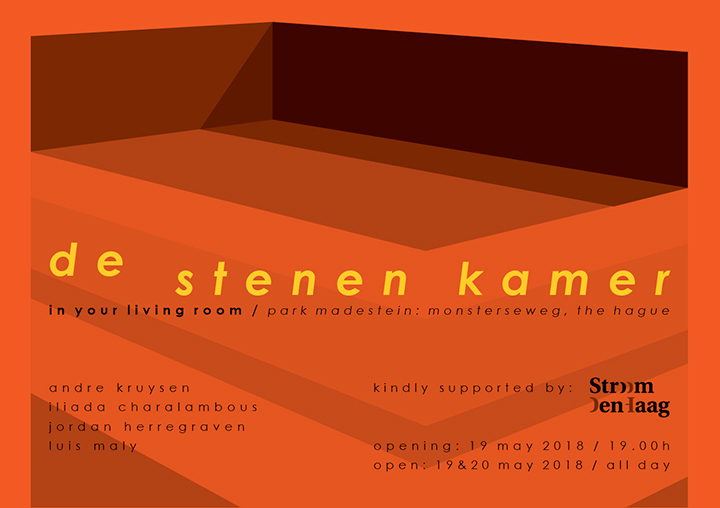 The exhibition “The Stenen Kamer” deals with the juxtaposition of contemporary art produced and presented in The Hague, placed within the city’s first settlement- De Stenen Kamer. The Stenen Kamer, is an archaeological site located in Madestein, The Hague and it is believed to be the first manifestation of civilisation and culture appearing in the area of the city, dating back to 1250-1300 AD. What remains on site today is the foundations of a structure which is believed to have been the first farm house, a sign of community that started to develop at this part of The Netherlands and eventually evolved into the city we know today. Archaeologists discovered the ruins of the Stenen Kamer in 1973 and since then it has been proclaimed as a monument and an archaeological site of The Hague. For residents of today’s multicultural The Hague it is an interesting location for an exhibition which will engage into a dialogue with the past and reflect on the way the city has developed.